May’s theme is Unleash Your Inner Goddess. 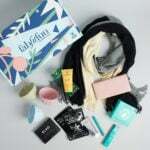 Included in this month’s box is a $25 gift card to ModaBox. Check out our ModaBox reviews here! The pain stops here. As does the search for a solution. Red, cracked, burning, broken, insanely dry skin finds its relief in this lotion. The life-changing ingredient? Macadamia oil. It naturally mimics skin’s own oils allowing it to be absorbed faster and without that undesirable greasy residue. Then, we blend this natural remedy with clinically-proven moisturizers to create the exclusive Promega-7. The results? Hurting skin is quieted and life is restored. Carol’s Daughter Shampoo, foil packet sample – Value $0.50? Carol’s Daughter Conditioner, foil packet sample – Value $0.50? The shampoo smelled of almonds and got all the dirt and grime out of my hair. This is for extremely damaged and over processed hair and it contains no sulfates, parabens, petroleum, mineral oils and artificial colors. The key ingredients include almond oil, aloe butter, rice bran extract, coconut oil, and shea butter. The conditioner is for extremely damaged and over processed hair too. It has no parabens, petroleum, mineral oil, and artificial colors. The key ingredients include almond oil, aloe butter, shea oil, shea butter, vegetable protein, and aloe leaf extract. Carrot Seed Oil: Rich in carotene and vitamin A, they act as anti-oxidants which repairs and reduce appearance of wrinkles by maintaining skin elasticity. It has anti-septic and disinfectant properties. This was easy to apply and didn’t smudge for the short time I had it on. I usual don’t wear gel or liquid eyeliner but this one made it less challenging to use. This is intended for curly or coily hair to give curl definition, reduce shrinkage, eliminate frizz, and give shine to your hair. It’s enriched with nettle leaf extract, aloe vera, and coconut oil. This works on wet or damp hair. This multipurpose oil is used as a cuticle treatment, to nourish and moisturize my hair, scalp, and skin. “Apricot oil is rich in fatty acids, vitamins A, C and E and Linoleic acid which help promote healthy skin and hair.” I used the apricot oil on my cuticles and it left them soft and nourished. Directions: Step 3 of LUE’s Skin Solution Set. As soon as you notice a flaw, dip the applicator or a cotton swab into CLEAR and apply to the spot. Hold for 30 seconds. Repeat up to 3 times. Use as needed. Can be used separately within any skincare regimen. Step 3 of LUE’s Skin Solution Set, CLEAR, a powerful compound which leaves skin smooth, radiant, and clear. Using a special blend of 12 herbs and organic biodynamic alcohol, this tincture is the ultimate spot control for leaving your skin flawless. Nubian Heritage Coconut and Papaya Bath Bomb, travel size – Value $7.50? This coconut and papaya bath bomb was relaxing and my bath water was slightly scented. Mesh Pouf Bath Sponge – Value $3.00? I can never have too many bath sponges, especially when I change them out often, as to not get mold and mildew build up. Shea Moisture Bubble Bath & Body Wash, foil packet sample – Value $0.50? Shea Moisture Body Lotion, foil packet sample – Value $0.50? The bubble bath & body wash was effective as a body wash, it has a rich lather for a gel type body wash and was lightly scented. The lotion was lightly scented as well, great for post showering but not as moisturizing, rich, and creamy as other lotions I have tried. This long-lasting edge smoother which doesn’t cause breakage and is enriched with shea butter, coconut oil, argan oil, and castor oil. Verdict: This month’s Cocotique box has a value of $56.32 (or $81.32 including the $25 gift card to ModaBox). That’s more than double the $20.00 cost of the box! I enjoyed pampering myself with this month’s products. If you are searching for an inexpensive subscription box that caters to beauty products this is the box. The value is there and their boxes are full of products for your face, body, and hair. This month subscribers were treated to a gift card from ModaBox, which was a nice surprise. Check out their blog for product info, discounts, their spotlight COCOBelle and COCOBlogger of the month and much more. What do you think of this month’s Cocotique “Mega Beauty Box”? What Women of Color boxes have you tried? Great review, but I don’t see how this box is worth it. Each month features the SAME beauty supply store brands and doesn’t stray far from haircare. Maybe I’m looking at it wrong, but I don’t see the overall value in it. The sponge you can find in any dollar store. Don’t get me wrong. I will buy anything to support any MWBE and the owner of Cocotique was featured on Queen Boss recently. I noticed the heavier focus on haircare recently too. In general, this box was always worth it to me, but I’ll admit this month’s box did seem a little sample heavy, in terms of smaller samples than they usually send. Usually, they do have a pretty good mix of beauty products though. I just started a temporary hiatus from beauty boxes, but since last year, I’ve subbed to all of the mainstream beauty boxes, along to a lot of obscure beauty boxes, and as unexpected as this sounds, I’ve received quite a few products from Cocotique at least one or two months before other beauty boxes started to feature them, so I’ve always felt that Cocotique was just slightly ahead of a couple of beauty box trends.